Thanks to our corporate sponsors, Komen Greater NYC is able work to towards its vision of a world without breast cancer. Each sponsor is a valuable partner, whose generosity and support is vital to the fight. There is no way to adequately thank them for their contribution to our work. Over the years, Komen has developed close, long-standing relationships with our corporate partners — many of whom have been supporters since the organization’s inception. They see the value of their commitment — in their communities and within their organizations, where each year more employees are getting involved and working to help eradicate breast cancer. Join the team! Make a difference! Reap the benefits! 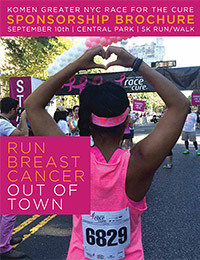 For more information, please contact Courtney Gush, Director of Development & Strategic Partnerships at 212-461-6185 or cgush@komennyc.org.